Hurricane Ike caused over $7bn of damage when it struck the southern United States earlier this month. Thankfully the human cost was low, but the official warnings for Ike's impact on the Houston, Texas area were significantly less accurate than the alert warnings issued by UCL's Tropical Storm Risk (TSR) venture. The UCL / TSR real-time forecasts outperformed the official forecasts issued by the US National Hurricane Center (NHC) in Miami at lead times out to 72 hours before Ike struck the US. 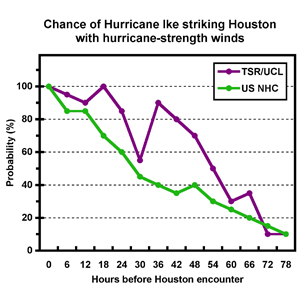 For example, 42 hours before Ike hit TSR calculated there was an 80 per cent chance of hurricane-strength winds blasting Houston - at a time when NHC was estimating just a 35 per cent probability. Professor Mark Saunders from Benfield UCL Hazard Research Centre is Project Manager and Lead Scientist at TSR. He said: "Our storm alerts were released to the some 12,000 people who'd registered to receive our e-mail alerts, allowing them to make better preparedness decisions specific to their own situation. "We are delighted by the performance of our model. It shows what can be achieved by a small UK University team working with limited resources compared to the large resources of the US National Hurricane Center. "I would like to acknowledge the significant contributions of my colleagues Dr Adam Lea and Dr Peter Yuen to this success." TSR has five major insurance companies as paying clients and there are plans to expand the scope of their audience with paid e-mail alerts to other users in early 2009. For more information on the Benfield UCL Hazard Centre and Tropical Storm Risk, click on the links above. Images show: This diagram compares the forecast chance of Houston being hit by hurricane strength winds by the two organisations. The satellite image shows Hurricane Ike making landfall over the USA.